Have you ever been into a department store and come out spending more than you planned? Or perhaps you have been stopped in the middle of the street to “answer a few questions” only to discover you have bought into an entertainment membership program? Perhaps you have unwanted magazine subscriptions or you signed up to Foxtel while all the time declaring you will never do it? Don’t despair. These are examples of just some of the tactics used by professional salespeople to manipulate you into complying with their requests. And it’s no surprise to learn that car sales people are the worst. But even Tupperware are guilty culprits too. 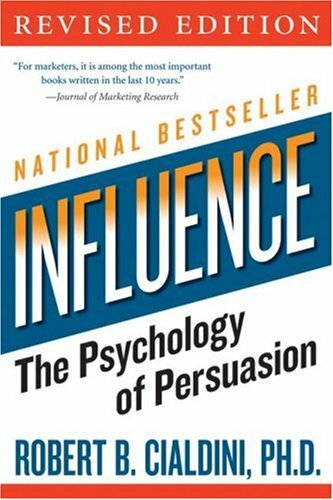 I have just finished reading a fantastic book called Influence – The Psychology of Persuasion by Dr. Robert Cialdini. This is a book that has been mentioned by far too many people and in various publications to ignore. I work in the field of marketing and communications and I read a lot of business and personal development books. Dr Cialdini’s book has been recommended again and again so I finally bought myself a copy and I have not regretted it. You see, as I was reading the book I was constantly nodding in agreement and amazement as to how, over the years, I have been manipulated and fallen prey to manipulative sales tactics without ever knowing I had been. We all have. It’s nothing to be ashamed of but I guarantee after reading this book, you will reassess how you are approached by the next salesperson you encounter when you buy your next major purchase, whether that is a suit, car or fridge. Depending on your purpose and motives, the book can be read for one of two reasons. One is to learn how to exploit human nature hot buttons for profitable gain. The second reason is to learn how to protect yourself from their exploitation. The book explains the psychology of why people say yes through six universal principles, how to use them to become a skilled persuader and how to defend yourself against them. Dr. Cialdini believes that influence is a science more than an art. He introduces you to six principles of ethical persuasion: reciprocity, scarcity, liking, authority, social proof, and commitment/consistency. A chapter is devoted to each and you quickly see why Cialdini looks at influence as a science. Each principle is backed by social scientific testing and retesting. Each chapter is also filled with interesting examples that help you see how each principle can be applied. The human brain is on automatic pilot for most situations. A great example of this was when Cialdini explained that a friend of his who owns an Indian jewelry store rang him with some interesting information. She was having trouble selling a certain allotment of turquoise jewelry at the peak of the tourist season. The turquoise jewelry was of good quality for the prices she was asking but they still would not sell. The friend attempted to shift them from their current location to a more central display area but with no luck. She also told her sales staff to “push” the items hard but still with no success. The night before the friend left on an out-of-town buying trip, she scribbled a note to her head saleswoman, “Everything in this display case, price X ½” hoping to get rid of the items, even at a loss. When the friend returned a few days later she was shocked to discover that, because the employee had read “1/2” as a “2”, the entire allotment had sold out at twice the original price. Why is it that after relocating and discounting stock, it could not be sold? But only once the stock was mistakenly increased in price, it was completely sold out? Cialdini says the customers were using a standard stereotype to guide their buying: expensive = good. The customers that wanted good jewelry saw the turquoise pieces as more valuable and desirable when nothing about them was enhanced except the price. Price alone had become a trigger feature for quality. Cialdini also explains that most of us are brought up on the rule that “you get what you pay for”. The customers had translated the rule to mean expensive = good. Humans have a tendency to let automatic pilot thinking take over. At to the delight of switched on marketers and profiteers, this has been our downfall. A classic example of a technique that Dr. Cialdini shares is using a gift to obligate someone. If we receive a gift, we are socially obligated to return the favor. Followers of the Hare Krishna movement used this technique to exploit this social response by giving flowers and books to people in airports and then asking for a donation. This proved to be an almost irresistible approach. The people would try to refuse the gift to not be obligated, but the Krisha followers wouldn’t let them. LIKING – The Guinness Book of Records has Joe Girard as the world’s greatest car salesman. He was General Motors best salesman 12 years in a row. Girard says that he offers a fair price and someone that they like to buy from (i.e. good looking/ good presentation/ flattery/ same as them/ on their side). AUTHORITY – Cialdini meets Vincent the super waiter. This is how he does it: 1) He is friendly 2) “I’m afraid that (whatever is ordered) is not as good tonight as it usually is. Might I recommend instead the …….” (a cheaper dish). 3) He seems to them to be friendly, knowledgeable, honest and on their side. 4) “Would you like me to suggest a wine to go with your meals” (excellent but costly and always followed by a similar dessert). 5) They say yes = bigger bill and bigger tip. I accompanied my sister to Harvey Norman recently because my sister wanted to buy a new mattress. She found a mattress that she liked. The advertised price was $949. She was happy with this price so she approached a salesperson. He came over to us and he said he will see what price he can do and walked off. I thought this odd at the time considering we knew what the advertised price was although my sister was going to attempt to bargain him down. He came back to us and said she can have it for $649. That is $300 off the advertised price. We both thought gee this is easy, no bargaining required. She was happy with this and accepted it. While my sister felt satisfied with this purchase because she expected to pay the advertised price, as I thought about this later, it occurred to me that Harvey Norman had no intention of selling it for $949 but for the price that my sister accepted. In hindsight, she should have still bargained for a cheaper price. After reading Cialdini’s book, I believe Harvey Norman utilised the contrast principle. According to Cialdini, the contrast principle affects the way we see the difference between the two things that are presented one after another. It is a weapon of influence because not only does it work, it is also virtually undetectable. It is commonly used by retail clothiers. For example, suppose a man enters a fashionable men’s clothing store to purchase a three-piece suit and a sweater. The salespeople are instructed to sell the most expensive item first because when it comes time to look at sweaters, even expensive ones, their prices will not seem as high in comparison. So in our Harvey Norman scenario, we were “presented” with the advertised price of $949 but when the salesman came back to us with a different price, our perception of the new price was that is was “cheaper”. And while it was cheaper than the advertised price, I believe we were fooled into a common sales tactic used by many of the large retailers. As I stated above, the tactic is virtually undetectable. This book is as applicable to the professional sales manager as it is to stay-at-home mum. The principles Cialdini teaches you can help you influence the most resistant of all audiences – your children. Care to share any of your experiences? Which side of the fence do you sit on? ~ by Shae on April 5, 2010. I have three recent experiences that confirm the sales tactics that you mentioned from the book. 1. I gave a $1 donation at a grocery checkout to a cancer organization for children. Although I’m more than happy to give a small donation to cancer charity, I do admit that there is a part of me not wanting to look like a stiff and reject a mere $1 donation to kids with cancer. There are other people in line who may be watching you so yeah, the Social Proof theory definitely applied there. 2. My internet provider recently called to offer me an upgrade that would be cheaper than my current service. When I kindly declined, they went on again about how this was a better deal and so on. I again declined, as I know that after a month they would probably jack up the prices. Should I want to return to my old service, there is a chance that they would jack up those prices as well. What wasn’t working on their behalf was the Authority theory. After years of dealing with their “offers” I’ve lost all confidence in them, even when there’s something good to be had. 3. While shopping at the supermarket, a young man offered me a $25 grocery gift card for $15. First of all, he caught me offguard and then seemed to rush what he was saying which led me to feel pressured. I declined and his response was “Really?” as if he couldn’t believe that I turned him down. I was wary of taking this deal under the circumstances, especially considering that there may not be $25 on the card. It turns out that another girl at the checkout had bought it from him and used it. He then asked me in the checkout line if I wanted the gift card for $20, as if the opportunity was quickly closing. I honestly thought about buying it, but decided that he was pushy, rude, and overall not a likeable person. His attitude was more of a selfish one…wanting to get rid of the card than it was of trying to hook me up with a good deal. I’m glad that I didn’t take the deal, even if it was legitimate. It only takes one time of getting screwed to overshadow dozens of times you’ve made out. The biggest red flag for me was “Hey, why would you sell me a $25 card for 15 and not 20?” He was in the store afterall, why not pick up some groceries?